I’ve been to a number of “tech” events lately with my brother Jordan, including CaseCamp, a dinner for the opening of the Northern Voice blogging conference, and most recently, the Strutta alpha launch party. My brother is the Director of Community Relations for Strutta, and you can read his blog for the site here. The Strutta party on Thursday night was to gather some feedback from those who will most definitely be its first official, and quite possibly, heaviest users. There’s still a few kinks to iron out, but it’s looking wicked so far. 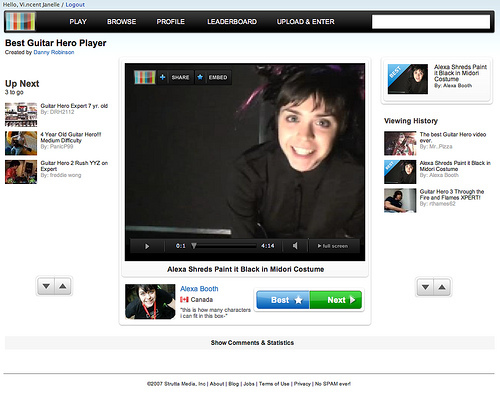 Basically, Strutta is a site to upload videos to show who’s the best at, well, anything. It’s an internet outlet to ‘one-up’ eachother in a “YouTube/American Idol/Hot or Not” type of fashion where the users vote for their favourite video in several types of bizarre categories (created by the users!). They’re planning on officially launching the site soon, so keep an eye out, and get signed up for an account! P.S. Get your sneak peak at the site below!! Thanks very much for coming Jan- and for blogging about it, too! I hope you’re enjoying the site- voting on lots of games and compiling feedback for us.